That buzzword has taken design, marketing, and startup blogs by storm and has put pressure on companies of all sizes to create the “perfect image”. In an increasingly competitive and noisy market, companies are more pressed than ever to carefully curate and create a recognizable identity – whether online or in the real world. People have a very short attention span. In fact, according to a Princeton University study, snap judgments count. The study found after seeing a face for only 1/10th of a second people formed opinions about that person. Judgments were made on attractiveness, likeability, and trustworthiness, and prolonged exposure to that face just reinforced the initial impression. Social media platforms like Instagram have pushed companies to evolve their brands and extend their branding to digital channels. Big companies spend millions doing this but most companies simply don’t have big enough budgets or the people who can effectively optimize branding across different channels. But even companies that lack people and money must find ways to showcase their brands if they are to compete. 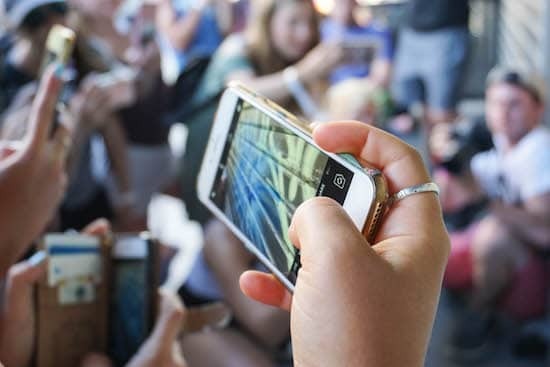 For most businesses, Instagram offers a good platform to attract and connect with customers. The access to customers also comes with a cost: customers on Instagram, for example, can easily pinpoint a company’s brand identity, or aesthetic. Marketing studies show that the average American is exposed to around 5,000 advertisements and brands per day. Out of that veritable flood, they found only 12 made enough of an impact to leave an impression. You can help your business be one of those twelve through effective, attractive design. Many brands have caught on, working on their emotional appeal through carefully thought out Instagram pages. But, as I wrote above, those brands often have huge amounts of resources. What can smaller companies do to properly take advantages of platforms like Instagram? Often, smaller companies try to use uniform filters and common colors. But these basic attempts are largely ineffective. Representing and creating your brand visually requires much more than a uniform filter and common color. 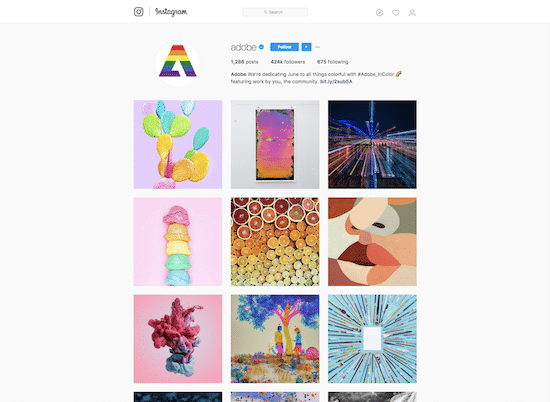 Luckily, there are many great brands on Instagram, providing lots of great examples and lessons to help you create the ultimate Instagram aesthetic. We’ve taken a look at some of our favorite Instagram accounts. Here are five insights to help you create a great Instagram brand, even if you don’t have a dedicated 30 person Instagram marketing team. Unless your company focuses on one or two colors, it’s likely that a majority of the content you post will be multicolored. For example, Adobe provides a variety of cloud-based software solutions tailored to the creative needs of everyone from students to large Fortune 500 companies. But at the core of Adobe’s values is providing a positive, professional design experience with an emphasis on exploration. If this sounds familiar, it’s probably not because you’ve read Adobe’s mission statement or company facts sheet. These values sound similar because they’ve been echoed in Adobe’s Instagram. Each picture is bright, colorful, and unique. None of the pictures are shown from a “standard” point of view, and none of them seem restricted by color, light, or layout. This makes it easy for Adobe’s Instagram to look like a melting pot of crayons. However, Adobe does a great job in planning out each post to include at least one color from the previous post. By using color transitioning, your eye is able to more easily slide across each post and make a connection- even though they are all very different. The best part is that you’re still able to use whatever you want as subjects and background scenes. 2. Include Your Company’s Purpose. Using your company’s purpose sounds more intuitive than it actually is, but remember to include your company’s purpose in a majority of your posts. Branding is not solely about consistency and pleasing aesthetics. Branding is also designed to remind customers about your product or service. On Instagram, many companies focus too heavily on beautiful pictures and punchy graphics but forget their call to action. It’s not enough to include a call to action in your caption (though a great caption is important). You have to subtly remind people what it is that you actually do – and what you want them to do in response to your posts. Otherwise, they’ll click the heart and move on. So focus on conversions and learn a lesson from companies like Google. The Google Maps Instagram account does a great job of including a little pinpoint on many of their pictures. 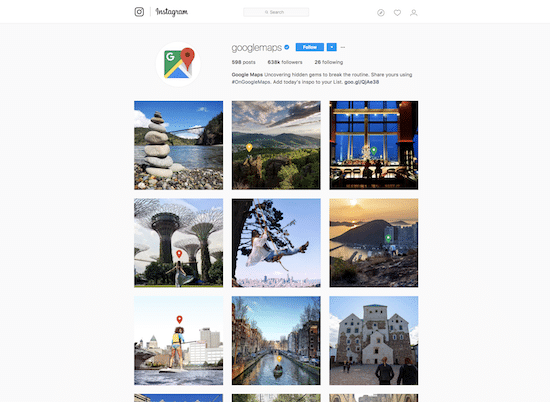 While the overall aesthetic of Google Maps’ account is travel pictures, the colorful pinpoints add a nice touch to remind followers that while the picture is beautiful, Google Maps helps you find that place. Interestingly, the pinpoints are all different colors, and they aren’t on every picture. The only thing connecting most of the pictures is that most pictures have a pinpoint. But because pinpoints don’t appear every time, they seem like a fun addition to a photo rather than an annoying marketing tactic. Smart brands develop a brand voice. Frooti is a great example. 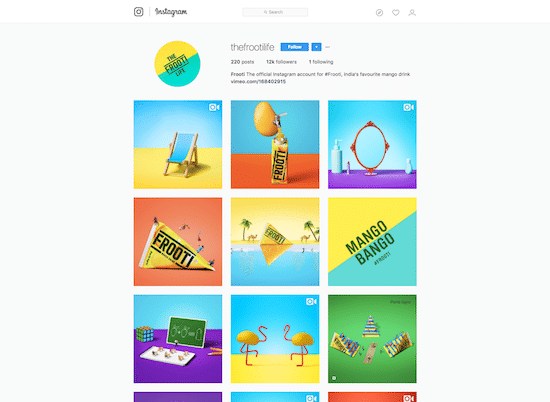 Frooti excels at showcasing a “brand personality” in its Instagram account. The Indian mango drink company is quirky, vibrant, and fun. They communicate this by using lots of bright colors (and only sticking to a few per post), and focusing on surreal graphics with large typography. There is clearly a lot of uniformity in Frooti’s feed, from the uniform font to the uniform color palette. But instead of trying to showcase traditionally artsy or powerful photos, Frooti relies heavily on creative graphics. Each post is carefully designed to make followers look more closely and smile, combining recognizable elements like flamingos with core parts of their brand (mangos). With the addition of videos, stories, and multi-photo posts, Instagram offers many medium options when it comes to sharing your content. Because a strong brand is consistent and recognizable, it’s important to pick the mediums which most strongly show off your content. And while it’s okay to mix it up and use multiple mediums, you should set an expectation for the type of content your audience should expect to see from you. NikeLab does this effectively by using videos to show their products in action. Since Nike advertises products for an active lifestyle, videos are a better way to showcase the products’ advantages and selling points. Yet although NikeLab’s most recent posts seem to all be videos, a few weeks ago their posts were mostly still images. 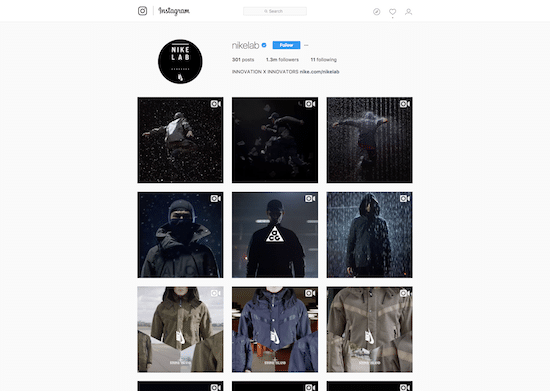 This change in strategy was deliberate – NikeLab phased out their photos and moved to video, much like brands do when they change brand colors. Another important thing to note (but unrelated to choosing your medium): NikeLab is one of over 20 different Nike Instagram accounts. Splitting up their brand into specific mini brands helps Nike focus on each vertical’s individuality and attract more customers. Of course, this strategy may not work for smaller brands or smaller budgets. 5. Remember Why People Are on Instagram. While you focus on your brand, don’t forget why people use Instagram. People love Instagram because of its beautiful photos and carefully curated view on daily life. Buffer shows that they understand this by posting stunning photos of places around the world, playing off of their existence as a remote team. 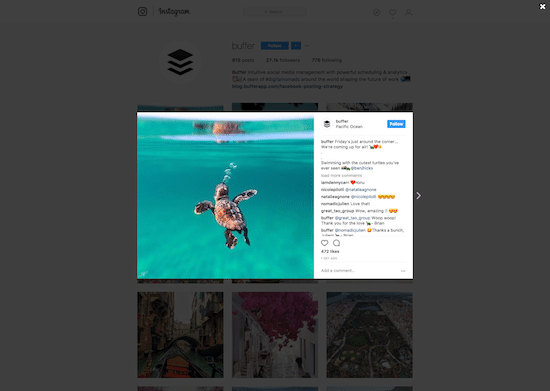 Buffer shows that they understand Instagram’s mission and its audience by posting stunning photos of places around the world where its remote team works and plays. But tying travel photos to the idea of a remote team isn’t what makes Buffer’s brand aesthetic so pleasing. It’s the captions that they attach to the photos. 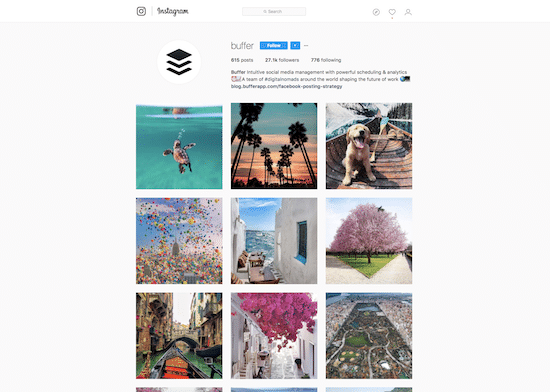 Since Buffer is a SaaS product, it relies on pictures from other Instagrammers. Buffer combines those photos with witty or inspirational captions that are designed to put a smile on your face. We love how playful the caption is and how Buffer leverages the community to help curate content and grow its audience. Buffer shows that it not only focuses on the community but also understands how to create emotional reactions with its posts. What can you do beyond, color, purpose, personality, a consistency, and community? After all, Instagram offers many other elements. The truth is that when it comes to Instagram stories, ads, and collections, it’s up to you and your budget. If you continue to guide your brand with color, purpose, personality, a consistency, and community in mind, then you can apply the same questions and solutions to Instagram stories and ads. Remember that any content you put on Instagram – whether free or paid – should increase your brand image/likeability, and seem organic. So be weary of being pushy with ads, and be careful about which influencers you work with on posts. And remember that you don’t have to post a million times a day to get attention. Your Instagram aesthetic is much more than just a pretty filter, large team, and a funny caption. Create a great first impression of your brand and you’ll be on your way to success on Instagram. Ready to take the next step? Engage with crowdSPRING’s community of over 200,000 designers and writers who can work with you to move your company’s brand and design to the next level for as little as $299.